This Spanish and Portuguese surname is of pre 5th century German origins. Recorded in the forms of Vela, Velez, Vella, Villareal, and sometimes Villa, the derivation is a short form of the original 'Vigila', a popular baptismal name used by the tribes of the Vizigoth. These fierce people from what is now East Germany, swept down through Europe to Spain and Italy in the year 410 a.d., destroying the Roman armies, and remaining as conquerors until the 8th century, when they in turn were defeated. During this period they imposed their culture on the natives population, the most popular of the Spanish given names and surnames such as Gonzalez and Ramirez being examples of the modern forms of Vizigoth names. In this case the name translates as 'battle-war' or similar from 'wig' meaning war and 'hild' - a battle. It has been suggested that some nameholders at least may themselves have a Roman (Latin) origin, and their surname descend from the word 'vigilia'. This was used as a description for a guard, one who kept 'vigilant'. 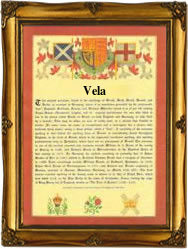 Early examples of the surname recording include Ximenez Vela at Chiclana, Cadiz, Spain, on March 1st 1593, whilst the surname was also early into California, Alba Villa being recorded at San Gabriel, L. A., on June 11th 1797, and John Raymond Vela at Antioch, Costa Contra, on May 19th 1947. The coat of arms has the blazon of a silver field, a black eagle displayed, within a blue border. The first recorded spelling of the family name is shown to be that of Joseph Villareal, which was dated March 26th 1563, at Nuestra Senora La Antigua, Valladolid, during the reign of King Phillip 11 of Spain, Emperor of Mexico, 1556 - 1598. Surnames became necessary when governments introduced personal taxation. In England this was known as Poll Tax. Throughout the centuries, surnames in every country have continued to "develop" often leading to astonishing variants of the original spelling.